Satellite broadband offers people living in remote locations or in communities with sparse populations that are not serviced by other internet providers the ability to have access to high-speed internet service. Satellite internet services are available to anyone with a satellite dish and a modem. This makes them useful in locations where installation of wiring used by DSL and cable internet providers might be limited. Satellite broadband relies upon a satellite orbiting above the Earth. The satellite orbits at the same speed as the Earth’s rotation, so it appears to be in a stationary position when viewed from the Earth. The orbiting satellite transmits signals that are received by dish located on or near a person’s home. The signals captured by the dish are picked up by a modem in the home for transmission to a computer or other device through a wire connection or by means of Wi-Fi within the home. The ability to receive satellite internet services requires a dish capable of receiving signals from an orbiting satellite and a modem to receive those signals from the dish and convert them into a format that your computer or smart device can use. The modem is the link between your device and the satellite internet provider. A computer can be connected directly to your modem with a cable to provide you with internet service. Homes or businesses desiring to set up a private local network would need a router. A router is connected by a cable to the modem, so multiple devices in your network can connect to the router either by a wire connection or by Wi-Fi. Other types of internet services use cable, fiber optics and ISDN make use of a wire or cable to bring the signal into your home. Instead of receiving and sending signals through a dish to a satellite, signals are received and transmitted over a wire or cable. Installation of satellite internet services requires a clear and unobstructed line of sight between the satellite and the dish in order to function. In the Northern Hemisphere, the dish must face in a southerly direction. Once the dish is installed, a wire is run from it to the modem located inside the home. Internet provided by companies using cable or other wired connections need to connect your home to the main system using a wire or cable connection. A wire run within your home to a modem allows you to connect your computer or other smart device to it to begin receiving internet service. Adding a router allows you to have Wi-Fi or to connect multiple devices using wires. Viasat and HughesNet are the two primary satellite internet providers. Prices at Viasat for service range from $50 a month to as high as $200 a month for download speeds of 12 Mbps up to 100 Mbps. 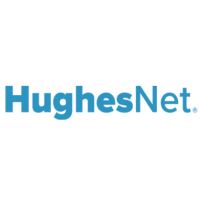 HughesNet offers satellite internet services with plans starting at $49.99 a month. Depending upon the data limits chosen by a consumer, plans at HughesNet can cost as much as $99.99 a month. Plan pricing for satellite internet services depends upon the size of the data cap for each plan. For example, a Viasat plan with up to 40 GB of data each month would cost $49.99 depending upon the speed selected by the consumer. HughesNet also prices its plans based upon the amount of data chosen by the consumer with a 10 GB plan priced at $49.99 a month and 50 GB of data available for $99.99 a month. Satellite internet providers can either cut off service to consumers who exceed their allotted data under their plans. An alternative to cutting off service is a reduction in the speed of a consumer’s service until the individual purchases additional data or the start of the next monthly billing cycle. Download speeds with cable internet providers can be as high as 200 Mbps. Fiber optic bandwidth speeds can be as high as 1,000 Mbps. ISDN operates two channels for each line at 64 Mbps per channel, but multiple lines can be combined to increase the transfer speed. For example, two lines could result in speeds as high as 256 Mbps. Satellite internet providers generally offer lower bandwidth speeds than other types of providers. Latency, the delay caused by a signal traveling over a cable or through space, is increased with satellite internet services. This is simply because the signal must through space to and from the orbiting satellite. Satellite internet providers have increased the number of people in this country who have access to broadband internet services. Provided there is an unobstructed line of sight between a dish and the orbiting satellite, service is available. In the continental U.S., a dish must be installed facing the south, so there cannot be anything, such as buildings or trees, blocking it from receiving or sending a signal to the satellite.